Its the painting 'Joseph's Dream' by Georges de la Tour (c.1640) that really holds my imagination when I read Matthews account of the birth of Jesus - in the gospel for this Sunday (Mt.1:18-25). I first encountered the painting through its use as the illustrated cover for George Steiner's Real Presences (a brilliant instance of the literary critic wagering on meaning and asserting the possibility of transcendence within the utterly immanent). So our Advent readings have at last brought us to the story of Jesus birth. We have heard the story of John the Baptist (Advent 3); we have been reminded of the winnowing of the harvest at the end of time (Advent 2); we have been reminded to be ready for when the Lord comes (Advent 1); and now, at last in Advent 4, our focus changes, the gospel lens fixes on the story of Jesus – the sweep of eternity is reduced barely to this man Joseph, and his bride to be, Mary. Except that the panorama of eternity has been reduced to a couple who are caught up in a difficult and compromising predicament: Mary is pregnant and Joseph has not had sexual relations with her. So, who is the Father? What has happened to the dreams that Mary and Joseph have shared and spoken about? 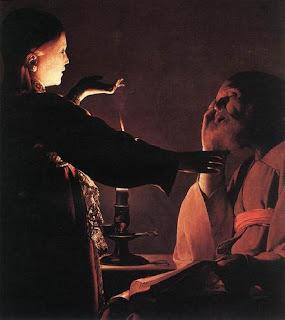 Does Joseph fear that his dreams have been a fantasy; that he has been wrong about Mary? That he has placed his hope in the wrong person? That is a tormenting thought. We can all understand that and how at this turning point of the gospel story there is this seed of doubt, fear and uncertainty -which could have blown the whole enterprise to nothing. What must Joseph do? In the coded language of scripture we are told that Joseph has a dream in which an angel of the Lord assures him that he is not to fear being mistaken and or betrayed but that this pregnancy is within the purpose of God. The Emmanuel, the Saviour, is near at hand. Well, the paraphrasing is my own, but that message which may work in a dream leaves the question of how it will appear when one awakes to the cold clear light of day? This moment is a pivot in the story of scripture. Is the dream illusion or truth? This is an agonising dilemma. One dreams; one wakes up – and what will Joseph think and do? Is it more likely, that Mary experienced sexual relations (whether welcome or unwelcome) OR that she is pregnant by the Holy Spirit? However that question is engaged, the messenger in the dream sweetens the message through a scripture passage familiar to the dreamer: (Isaiah 7:14) “Look, the virgin shall conceive and bear a son, and they shall name him Emmanuel," which means, "God is with us." Joseph chooses to trust his dream – the dream that draws him back into the story of Israel and the promise of the prophets, back into a story larger than himself but nonetheless his story also . What I see in Joseph’s story is a reflection of our own story of doubt and faith: the constant dialectic played out in our lives day by day. Sometimes our faith seems so unreasonable, irrational, and it is as if we are clinging to an illusion, clinging to a story to reassure ourselves against the frightening prospect of a universe that has no meaning. Joseph, trusts the dream, the story of Israel, and chooses to take his part in the great story of God. This may help us to see Joseph as an icon for Advent. His dream gives him the light he needs to proceed amidst the darkness of incomprehension and uncertainty.